Hello friends of the internet. It’s a special day, this day. No, it’s not National Avocado Day, or even International Sandwich Bigger Than Your Head Day…it’s my birthday! Today there will probably be gifs of Leslie Knope, there will definitely be breakfast croissants, and there will hopefully be a new couch delivered directly to my living room, through a hopefully not too narrow doorway*! Otherwise though it will be a pretty normal Friday. But on a birthday a girl’s gotta party a little, right? 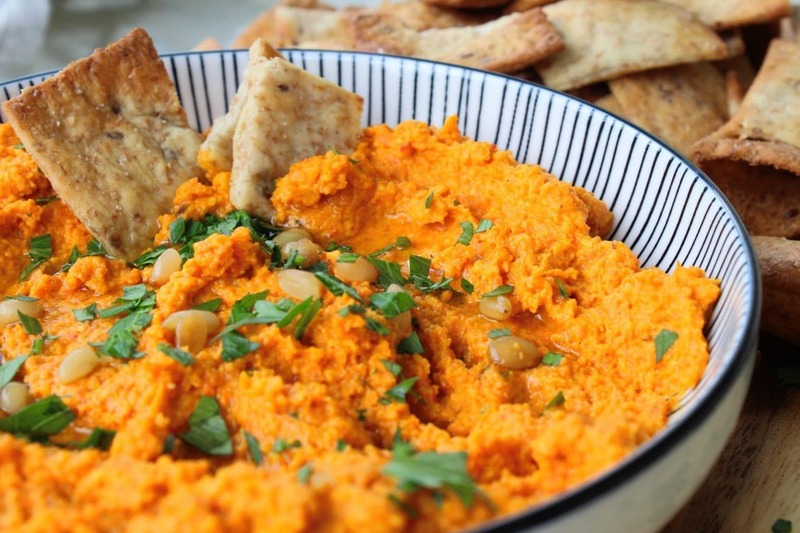 And as such I give you this most celebratory recipe of spicy carrot dip? Ok, it’s not a cake, not even a confection of any variety. But it’s my birthday and I’ll blog about vegetable based dip if I want to! 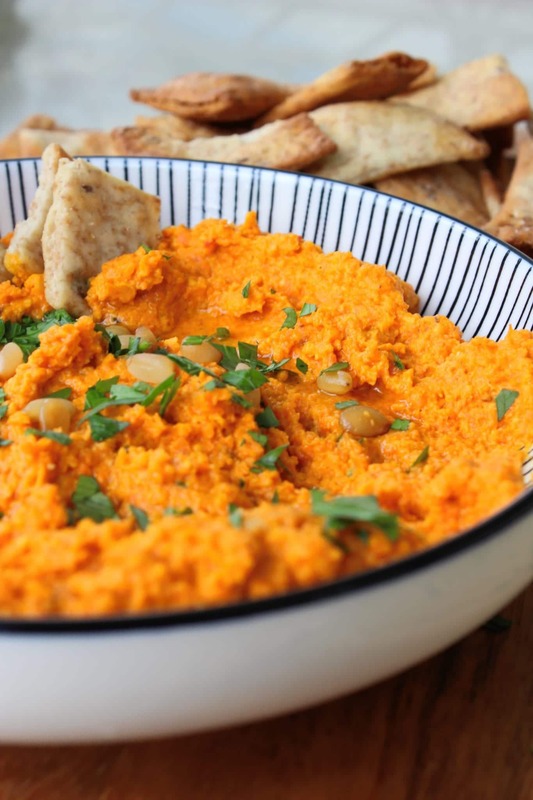 It uses pretty standard ingredients, with the exception of harissa, which now you can get at most grocery stores (I picked mine up at Trader Joe’s). Vegetable as main ingredient = get to eat more chips. It’s a little different from the usual suspects – smoky, spicy, and just a touch sweet. It’s pretty (I realize I said top three, but birthday privilege kicked in). So happy birthday to me and happy dip day to you. Have a beautiful Friday! *I might be more excited for this couch to arrive than for my actual birthday, honestly. **Make the dip, it’s totally awesome. But if you wanted to help me celebrate in some other, meaningful way you could always donate to a cause that’s close to your heart. That would make me happy as well. 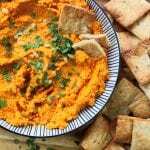 This recipe is great in that it’s made up of stuff you tend to have lying around – ie: this is a stellar way to use up those carrots that have been laying to waste in your crisper drawer. 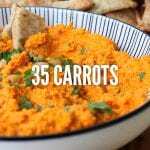 Combine carrots and 2 tablespoons of oil on a rimmed baking sheet. Sprinkle with the black pepper and half of the kosher salt. Toss to coat and spread into an even layer. Roast carrots for about 25 minutes. They’re done with they look golden brown at the edges and the tip of a paring knife slips in without resistance. In a food processor pulse the garlic until it’s finely chopped. Then add the carrots, yogurt, remaining salt, harissa, and pine nuts. Process to finely chop all ingredients. With the machine running, stream in the remaining olive oil and all of the water. Scrape down the bowl and continue to process until you have a uniform consistency a bit thicker than hummus. Garnish with extra pine nuts, chopped parsley, and a drizzle of extra virgin olive oil. 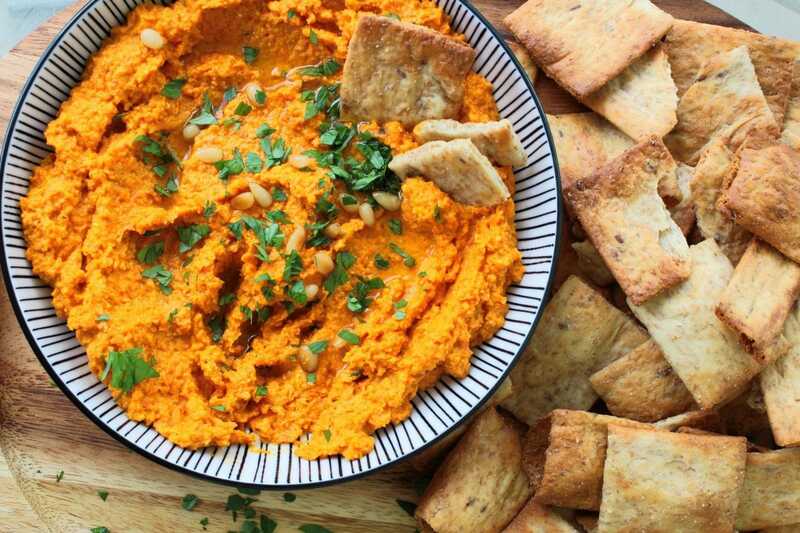 Serve with pita chips, or any chips, or veggies if you must. *The only real special ingredient here is harissa, which is spicy stuff – I did not anticipate how spicy the very first time I used it and thusly ruined an entire chicken (another story for another time) – so a teaspoon is enough to get a little background tingle. If you want more heat, add it gradually.